Editor’s Note: This is the ninth in an ongoing series of commentaries analyzing the individual Guiding Principles of the Certified Signing Specialist™ Code of Conduct, released by the Signing Professionals Workgroup in October 2013. We said earlier that Guiding Principle 6 could very well be the most relevant of all Code principles because loan documents contain borrowers’ personal and financial information, and Signing Specialists must implement security measures to ensure this information remains private and confidential. While lenders, borrowers and the Signing Specialist’s contracting companies would likely say Guiding Principle 6 is the most important element of the Code of Conduct, Guiding Principle 9 would be a close second. This is because Guiding Principle 9 addresses Signing Specialist professionalism. A Specialist’s primary customer is the title or signing company that provides the loan document assignment to and directly pays the Specialist. However, there are other parties to the transaction who are indirect customers. These include the lender, the borrower and any investor who purchases the loan after closing. All of these customers expect a high degree of professionalism from Signing Specialists, and Guiding Principle 9 includes provisions designed to meet the expectations of each customer. For example, the Standards of Practice for confirming the appointment (9.10), cancelling and rescheduling appointments (9.4), wearing appropriate attire (9.12), notifying of late arrival (9.13) and presenting an identifying credential (9.14) apply most directly to the Specialist’s professionalism with a borrower. Similarly, the Standards related to refusing assignments (9.10), not overbooking assignments (9.2), delegating duties (9.3), carefully reading contracting company instructions (9.7), following a signing script (9.5), sending professional communications (9.11), reporting status (9.16) and observing deadlines (9.18) apply most directly to the Specialist’s professionalism with a contracting company. 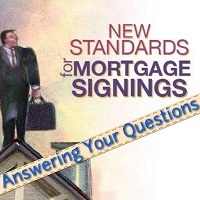 Lenders also want Specialists to follow these Standards because they have master service agreements with title companies and other entities that contract with Signing Specialists for loan signing appointments. To be clear, these Standards may apply to more than one customer. Overbooking appointments (9.2) doesn’t just impact a contracting company. If a Signing Specialist is late to an appointment it impacts the borrower. Similarly, lenders are just as concerned as contracting companies about Signing Specialists showing up in borrowers’ homes dressed appropriately (9.12), because the borrower is ultimately the lender’s customer, and a Specialist’s attire either reflects positively or negatively on them.